Our ability to deliver all-natural and flavorful products is only because of our people who are our greatest assets and work tirelessly to hand-carry our creations for you. The Managing Director of the company the younger of the two siblings he has played the perfect foil to the elder in initiating the GREEN FIELD initiative of the factory in Roorkee. Leading from the front in all factory operations a person with hand on person in executing all details at the plant level. A Delhi University graduate from Kirori Mal College in commerce. He saw an early need to become a lead player in the trade of Honey in the world. Driven by his passion and conviction in his belief and he was one of the few to receive a formal training in beekeeping and Honey processing from University of Warmia Olystyn Poland. Beekeeping and Honey testing with a formal training in collection and use of other Bee products like Pollen, Propolis, Bee Venom and Bee Bread which are extremely useful as a natural source for Protein, antiseptic, having immense healing powers for human being. Slowly he built a global presence & a robust structure supported by a state of the art production factory in India to cater to the global markets. 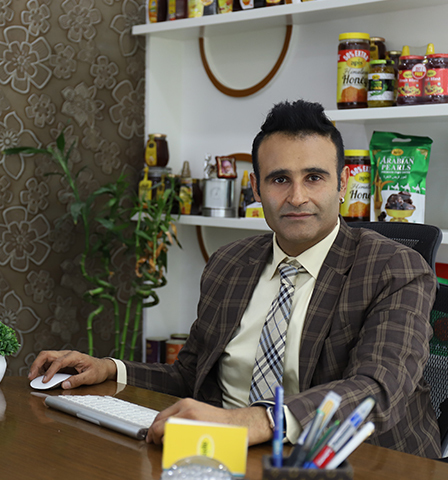 His undeterred leadership and vision has led the company to reach the heights today in becoming a lead player in organized honey trade in the world. With his open leadership styles he leads from the front and looks after the critical Sales, Marketing and Procurement functions of the company.